State electricity company GECOL has signed its Memorandum of Understanding (MoU) with Greek construction company METKA to build a new 736-megawatt (MW) power station in Tobruk. 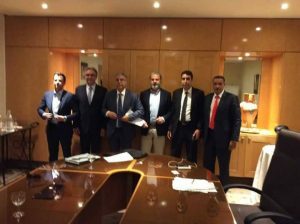 According to GECOL, the contract itself will be agreed in the coming days in Tobruk itself following the MoU deal last Thursday in Tunis. As well as METKA and Presidency Council (PC)-backed GECOL chairman Abdulmajid Hamza, representatives from America’s General Electric (GE) were also present at the MoU signing on Thursday. The new power station will use four GE gas-powered turbine units. The latest announcement expands on what had been previously announced about the deal. In January, it was announced Libya METKA would construct a 500-MW power station in Tobruk which would have three gas turbines. The value of the deal for METKA was put at $380 million. It would include substations. At the time, METKA revealed the first turbine would be built and commissioned within nine months, with the rest following in the following two months. Hamza was appointed the new head of GECOL last July when PC head Faiez Serraj sacked its previous board.